The Highmark RIDGE 3.0 avalanche airbag comes with the super lightweight, incredibly compact Snowpulse 3.0 Inflation Technology. 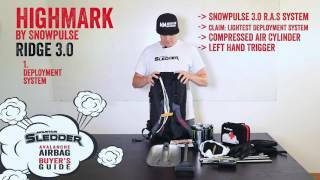 This is Snowpulse’s lightest airbag system of all time and is the lightest avalanche airbag system on the market. The Highmark Ridge was designed to meet the needs of snowmobilers who demanded an intelligently-designed, compact and low-profile avalanche airbag. The RIDGE is an avalanche airbag that fits so well, you’ll never notice you’re wearing an avalanche airbag. The RIDGE 3.0 features Snowpulse 3.0, the latest in avalanche airbag technology – new ultralight, ultracompact avalanche airbag system and more user-friendly set-up. Snowpulse’s new deployment handle is more intuitive to operate and is also height-­adjustable to allow it to be adapted to the wearer’s body height. The deployment handle is now a bright orange color to make it even more visible. There is no change to the tried-and-tested “T” shape of our ­deployment handle. The handle can be folded to allow compact storage in the shoulder strap.